Char Broil’s The Big Easy TRU-Infrared Oil-Less Turkey Fryer is a welcome addition to any home especially during the holiday season when most of us will cook a turkey for the family for the Christmas holidays! The claim is that the infrared technology in the TRU Infrared Oil-Less Turkey Fryer cooks the bird faster and allows more juices to be retained making the bird much more succulent and flavourful overall when compared to the slow, dry heat of an oven. The hype is realized by the fact that the TRU Infrared Oil-Less Turkey Fryer is similar in appearance to a turkey deep fryer and does basically the same job, which is cook a juicy and delicious turkey in a fraction of the time of a traditional oven, BUT it does it without a shred of cooking oil so that the fat content is way lower and therefore the calorie count is much lower as well. 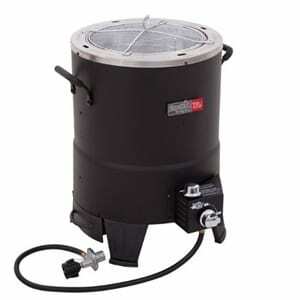 The cost of the Char Broil Big Easy TRU Infrared Oil-Less Turkey Fryer is only $79.99 at Amazon.com. This is a really good price for a unit of this size and technology. Not much commitment required for the TRU-Infrared Oil-Less Turkey Fryer. You simply need to get a tank of propane to fuel the unit and you are good to go! No big jugs of cooking oil needed for this unit, just a place to stand it while in use and a place to store when not in use. Pretty simple. Clean up after a cook out is pretty easy as well. While we have only mentioned Turkey thus far, the reality is that the TRU Infrared Oil-Less Turkey Fryer can be used to quickly and efficiently cook a wide variety of meats. You can effortlessly cook up to 16 full pounds of whatever meat you choose at one time which is incredibly convenient when cooking for a large extended family over the course of the holidays. You can season or dry rub a roast of beef or pork tenderloin or even multiple small chickens and put them in the unit and in no time at all have a succulent and juicy meal that the whole family will enjoy. There are so many benefits to having the TRU-Infrared Oil-Less Turkey Fryer , especially if you have a large family or extended family that visits for the holidays over the course of the year. The infrared technology allows you to cook very large cuts of meat in a fraction of the time a normal oven would do the same job and the cuts come out juicier and more delicious! The unit comes with a cooking basket and a lifter for large cuts of meat, a meat thermometer and a quick start cook guide to get you used to using the unit and familiar with all settings and times. What more could you ask for! We love the fact that you can cook large meals for the whole family quickly and efficiently with the TRU Infrared Oil-Less Turkey Fryer AND be health conscious at the same time. We heartily endorse this unit for that reason. Give it a try yourself and you will be very impressed with the quality of food you can produce in half the time! If you only need to cook a small turkey or chicken then you may prefer the Halo Oven. What do you think? Does the TRU Infrared Oil-Less Turkey Fryer work or not? Does the Sound Asleep Dream Series Air Mattress Really Work?